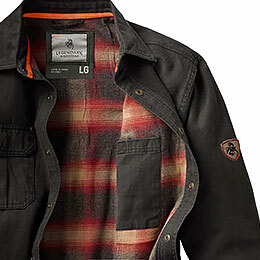 Men's Journeyman Flannel Lined Rugged Shirt Jacket is rated 4.7 out of 5 by 1000. 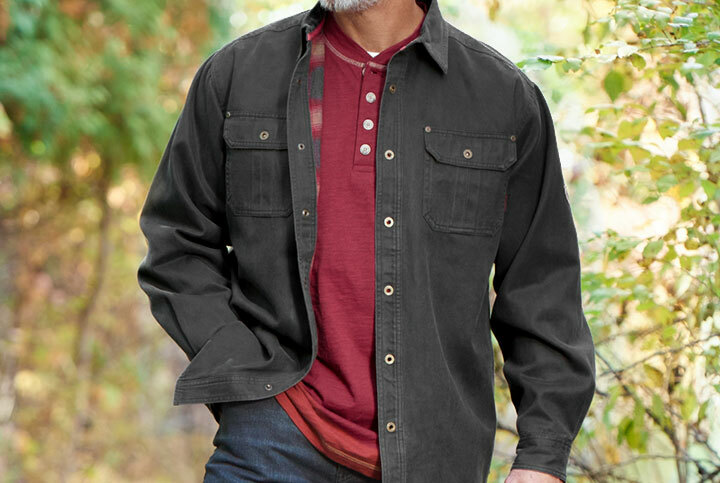 The rugged cotton suede look gives this shirt jacket a one-of-a-kind appearance, but that's not all. 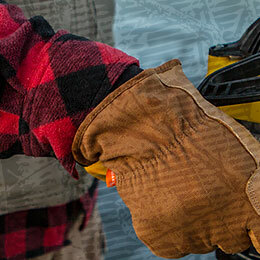 It also makes the fabric softer to the touch, durable, and more weather-resistant. 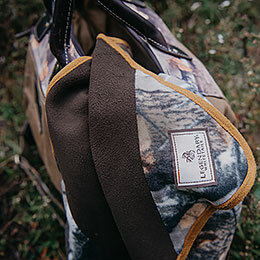 The Journeyman is leather tough on the outside...but inside, you'll appreciate the plaid flannel lining. It adds an extra layer of softness that goes a long way toward keeping you warm and comfortable, no matter where you're headed. 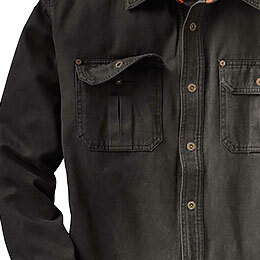 We added a flannel lining to our popular weathered cotton ’leather’ shirt to build this one-of-a-kind shirt jac. 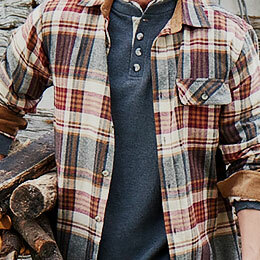 The rugged cotton suede look comes with an unexpected softness. 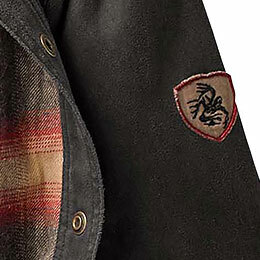 Features side hand warmer pockets, antique brass Legendary® snaps, Signature Buck appliqué, and double needle stitching. Cotton/poly blend. 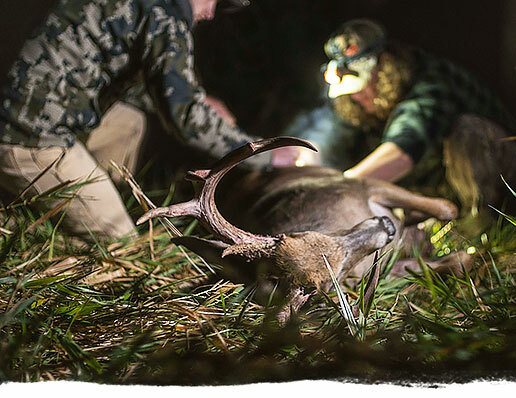 Our top selling Shirt Jacket of all time offers the best bang for your buck. 100% Satisfaction guaranteed. Love it or send it back >> On us. Rated 1 out of 5 by Brianpcooney from Not what i expected. not rugged at all In the picture, this looks like the outside is like some sort of denim. It's actually more like some cheap, thin, synthetic fabric. In the picture, the inside looks like it's flannel. It's not. It's just thin cotton like material with a plaid pattern. It's also horrendously oversized. I'm on the large side of a size large, and other comments said it runs a bit big, so i ordered a large because i wanted a big comfy jacket. Instead, this thing goes down to my knees and looks like something a clown would wear. Gonna wash it in a hot wash with some bleach, hopefully it can soften it up so it doesn't feel like a huge raincoat. Rated 1 out of 5 by Curt from The only bad quality product they sell! I have bought 2 of these over the past while and both fell apart because of substandard China workmanship. Everything else I have bought here is great! Rated 3 out of 5 by Andrew from Nice shirt jacket...runs big Really nice shirt jacket with quality materials. Well put together too. 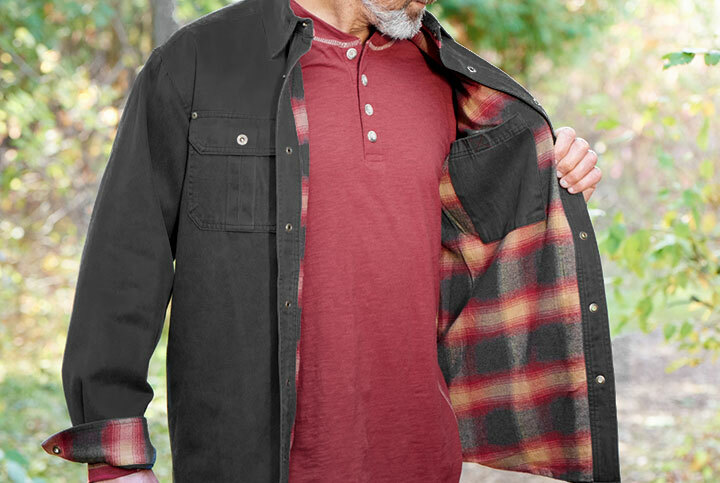 The flannel does not line the sleeves so if you have short sleeves on underneath you may get a chilly surprise when you put it on. Definitely runs big. I'm a 42R and feels like putting on a 46 with the large, but if you are wearing layers it should work nicely. If I did it again, I would have gotten a medium but bought on clearance so no returns. Regardless, I like it and will wear it, and more importantly, my wife likes it! Is this jacket waterproof or water resistant? 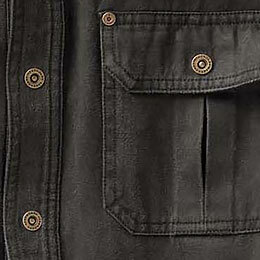 is the inside chest pocket large enough to carry a concealed handgun? WHAT IS THE SLEEVE LENGTH ON THE XL SIZE? . MY SHIRTS ARE A 34/35 IN SLEEVE LENGTH. WOULD IT BE BETTER IO ORDER A XL TALL? Is this more of a fitted or classic cut jacket? I went to wear 42&quot;-43&quot; &quot;large fitted/slim&quot; shirts so I'm torn between M and L without non-generic/actual measurements for the chest/waist. The chest on a medium is 22 1/2&quot; and on the large it is 24 1/2&quot;. Our reviews have been showing that it is running large.